What’s the world of games got to do with growth strategies? There are the obvious things like having a clear goal, having competitors, taking risks and allocating resources. But, there’s also the weighing up of decisions, deciding which move will be the best move, which move will take you forward and which will defend what you’ve already got. It was this thinking that led to the development of our GameBoard framework. We developed a category map for our client based on occasions and need-states and plotted where our client’s brand played. By using this as a framework, we worked collaboratively to stress test whether the brand could extend into adjacent spaces and, if so, with which products. We were also able to identify other occasions where the brand could meet similar need-states and vice versa, in effect where the brand could hopscotch across the board. 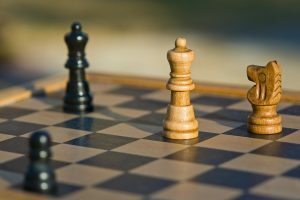 In work sessions, we played out how competitors could respond to our favoured moves; the board helped develop defensive plans as well as expansion strategies. A major advantage of the GameBoard is that it acts as a visual mnemonic; it distils a wealth of primary and existing insight into an interactive, intuitive playing field that can be shared with colleagues and the trade. A win-win situation! Whilst we’re unashamedly serious about helping your business flourish, we’re equally committed to making the journey an enjoyable one. Please get in touch if you’d like to know more.